The flute is made in the form of an open cylindrical air column about 66 cm long. Its fundamental pitch is middle C (C4) and it has a range of about three octaves to C7. Sound is produced from a flute by blowing onto a sharp edge, causing air enclosed in a tube to vibrate. The flute as shown above is a transverse or side-blown flute. The modern flute was developed by Theobald Boehm who experimented with it from 1832 to 1847, desiring to give it a bigger tone. He finally produced a parabolic (bowl-shaped) head joint attached to a cylindrical body with open-standing keys and finger pads to cover large finger holes. There are typically 16 holes, or four more than the minimum to cover the chromatic notes of an equal-tempered octave. Since then, other minor improvements have been made. The modern flute usually has a range from middle C (C4) upward for about three octaves. In Europe flutes are often constructed of wood; silver is commonly used in the United States. Thanks to Sara Booker for helping to demonstrate the instrument. The modern flute is about 26 inches in length with and inside diameter of about 3/4", open at one end . The embouchure at which the edgetone is produced is near one end and constitutes a second open end, making the flute an open cylinder in harmonic content. As with other edgetone instruments, the tone production is made more efficient by the coupling of the slit formed by the players lips, the edge, and the air column. The flute has a series of 16 openings in the tube wall, 11 of which can be closed directly by seven fingers and one by the left thumb. The four additional openings can be opened or closed by means of suitably arranged keys. The external structures on the flute which aid the players access to all the holes total about 150 springs, rollers, levers, etc. One advantage of the flute over the recorder is that the player has direct control over the angle at which the air from the lips strikes the embouchure hole. Rolling in or out with the lips relative to the edge gives the player a greater range of volume and expression, and aids the process of overblowing to achieve the higher register. This direct access to the edge also permits the player to make small fine tuning adjustments. This image shows the form of a U.S. flute up to the tuning joint. In Europe flutes are often constructed of wood; silver is commonly used in the United States. The lower notes of a flute are obtained by opening holes in the side of the instrument to shorten the air column, raising the fundamental frequency of the open air column. To achieve higher notes, one may force the air column to sound its second harmonic, up an octave from the fundamental. This is achieved by a process called "overblowing" the flute, and the notes produced are said to be in the "upper register" of the flute. The flute is sounded by the edgetone principle: directing air on an edge causes it to oscillate. Increasing the airstream velocity tends to make the pitch go up, and "rolling in" the players lips toward the edge aids that tendency. By rolling in and simultaneously increasing the airstream velocity, the air column can be made to pop cleanly from its fundamental to its second harmonic, raising the pitch by an octave. The fundamental and all harmonics are resonances for an open air column. Increasing airstream velocity raises the edgetone frequency. Decreasing the slit-to-edge distance raises the edgetone frequency. The flute is overblown to its second or third harmonic by a combination of increasing the airstream velocity and "rolling in" to decrease the gap between the players lips and the edge. The lower notes of a flute are obtained by opening holes in the side of the instrument to shorten the air column, raising the fundamental frequency of the open air column. To achieve higher notes, one may force the air column to sound its second harmonic, up an octave from the fundamental. This is achieved by a process called "overblowing" the flute, and the notes produced are said to be in the "upper register" of the flute. 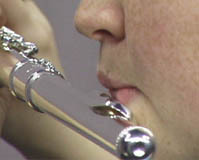 Besides those basic ways to vary the pitch of the flute, the player may make "fine tuning" adjustments by control of the air stream from the lips. The pitch can be lowered slightly by aiming the air in a downward direction into the embouchure hole, and raised slightly by aiming the airstream higher so that it crosses over the embouchure hole. In addition to the velocity of the airstream as a determiner of the pitch of an edgetone, the distance between the slit and the edge also influence it. 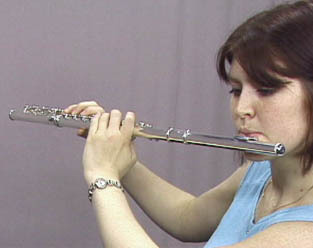 It is common practice in flute playing to "roll in", decreasing the slit-to-edge distance to help produce optimum conditions for higher notes. This helps the process of overblowing to reach the higher registers.